Product information "NOA 61 Optical Adhesive 1 oz bottle"
Norland Optical Adhesive 61 is a clear, colorless, liquid photopolymer that will cure when exposed to ultraviolet light. Since it is a one part system and 100% solids, it offers many advantages in bonding where the adhesive can be exposed to U.V. light. The use of NOA 61 eliminates premixing, drying or heat curing operations common to other adhesive systems. Curing time is remarkably fast, and is dependent upon the thickness applied and the amount of ultraviolet light energy available. NOA 61 meets Federal Specification MIL-A-3920 for optical adhesives and is approved for use on all government contracts specifying such adhesives. The adhesive is designed to give the best possible optical bond to glass surfaces, metals, fiberglass and glass filled plastics. 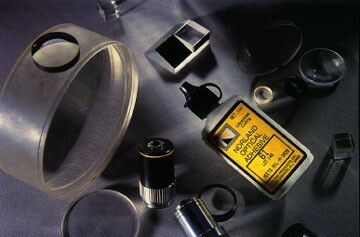 NOA 61 is recommended for bonding lenses, prisms and mirrors for military, aerospace and commercial optics as well as for terminating and splicing optical fibers. Shelf life of the liquid is at least 4 months from the date of shipment if stored in a cool (50C - 220C), dark place in the original container. If refrigerated, allow the adhesive to come to room temperature prior to use. Related links to "NOA 61 Optical Adhesive 1 oz bottle"
Customer evaluation for "NOA 61 Optical Adhesive 1 oz bottle"